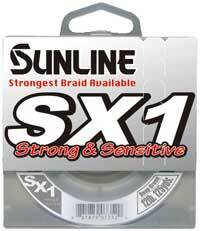 SX1 is a ULT-PE braided line featuring improved abrasion resistance. This improvement is not from applying a thick coating to bolster the material, but by improving the raw fiber. This new design still retains suppleness for excellent line control in any situation. The slick line surface of the uncoated fiber brings out the longest casting distances while allowing good, tight knots to be formed. Sunline pros Brent Ehrler and Aaron Martens have been two of the strongest advocates for using braided line in numerous applications. They tested numerous prototypes before the new SX1 was developed. SX1 performs equally well on spinning or baitcasters. Unique surface processing for a sleek finish, reducing guide friction and giving you long casting distance.